Nolagirl and I were walking towards the Mesa Arts Center on Main Street in Mesa, AZ. I want to go look at that rocketship thing, I told her. Right there by the lightrail stop? she confirmed. I explained I’d taken phots of it in 2016. but I didn’t have any information about the artist. I wanted to find the name of the piece or the name of the artist or something. We walked across the street, and Nolagirl gazed at the art. I wouldn’t have called it a rocketship, she said, but I get it. I suspected it wasn’t supposed to represent a rocketship, but that was the closest comparision I could come up with. The round, tapering shape suggested a 1950s concept of space travel to me. 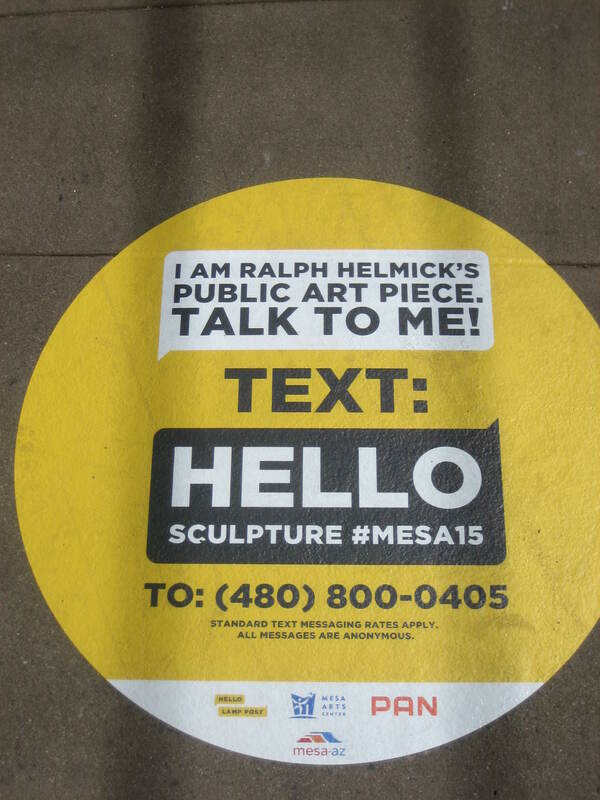 I couldn’t find any permanent information about the art, but Mesa was having a silly event where folks could interact via text with inanimate objects downtown. This piece of art was part of the project, so I was able to find the artist’s name in a cirlce on the ground. Nolagirl actually texted this object as I was looking for information and taking photographs. Their exchange was rather boring. We were totally over it when the sculpture asked what business we wanted to see downtown. A free box! I chimed in, but I think Nolagirl had already told the art something else. These faces belong to real people. Those people are part of the Mesa community. The art piece does have a name, although I couldn’t find it anywhere in the area. (I didn’t go up on the actual lightrail stop waiting area where the seats are. Maybe the name of the art is somewhere over there.) According to Ralph Helmick’s website, the piece is called Drawing Room. The website explains about the faces on the piece. 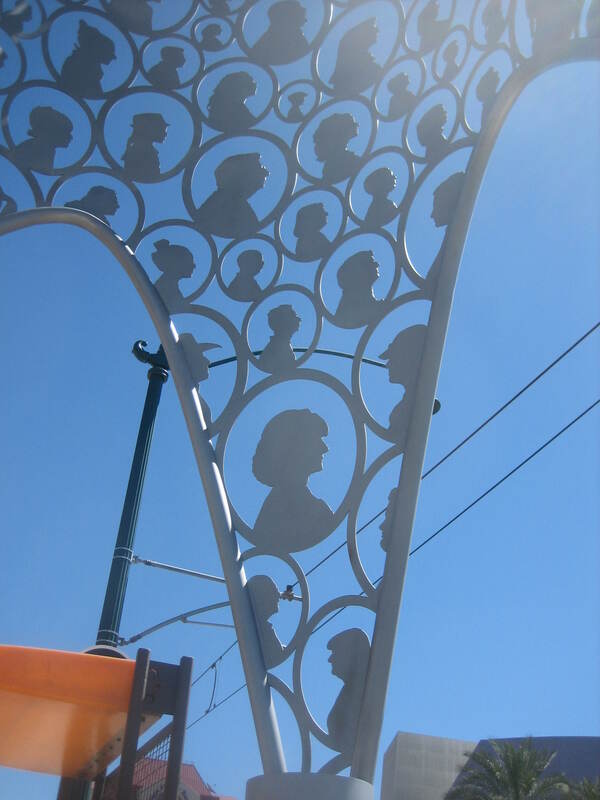 Its walls are comprised of graphic cutout silhouettes of an inclusive array of actual Mesa citizens. Each profile occupies an oval frame that connects with its neighbors, the collective creating a soaring web of community. I think it’s really cool that the silhouettes are of actual people who live in Mesa. I wonder how the folks were recruited. I wonder if folks ever scrutinize this piece of art to find their own image or the image of a loved one. 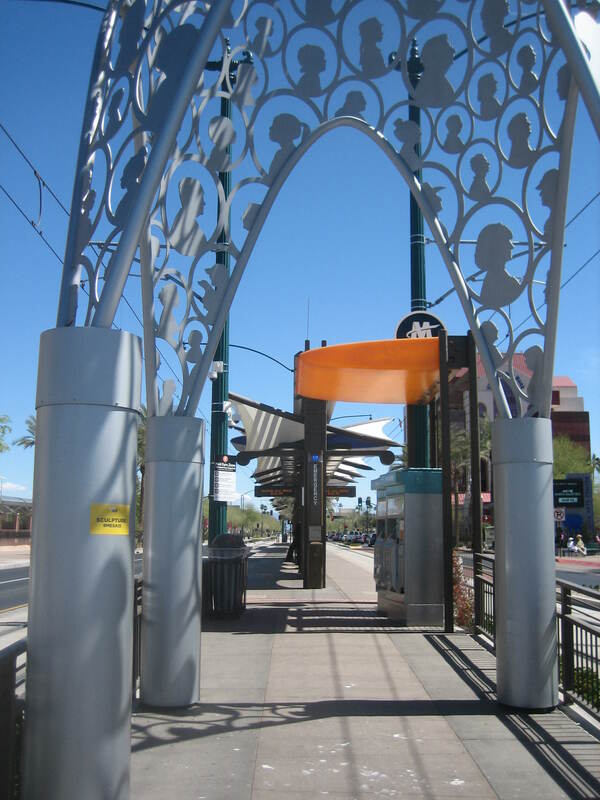 Taking the shape of a giant conic form of perforated metal, viewers recognize it as a visual beacon from blocks away and walk underneath while passing to and from the light rail. You can definitely see this piece from blocks away. It’s a good landmark for not just the lightrail stop, but the Mesa Arts Center as well. I definitely noticed that it’s a portal. To get on the train or return to Downtown Mesa, commuters have to pass through this portal of community. You must pass through this portal of community to catch your train. The website mentions another thing I’d noticed. 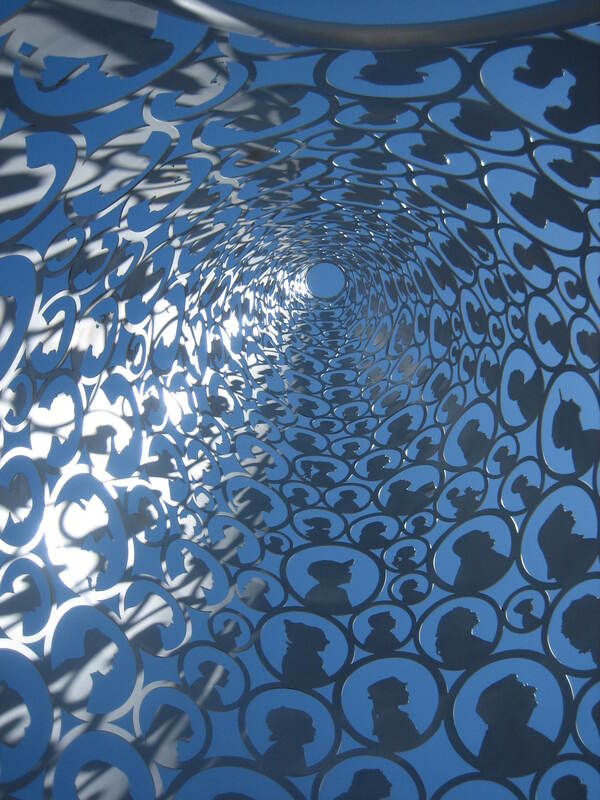 Viewers looking up from beneath the sculpture may draw parallels between our interest in the expansive mysteries of the universe and our quest for civility and fellow-feeling here on earth. Well, ok, I didn’t draw any parallels or think any deep thougths, but I did notice that it’s really cool to stand within the sculpture and look up, up, up all the way to the hole in the top. The experience is a little dizzying, but very, very cool, especially when light and shadows are playing on the metal. Ralph Helmick is a sculptor and public artist. Since his first public art commission in the mid-1980’s – the Arthur Fiedler Memorial, on Boston’s Esplanade – he has worked in various materials (including metal, stained glass, cast resin, and found objects) to create large-scale public sculpture in parks, schools, museums, and other public spaces across the US. As I did research on Drawing Room and Helmick, I was surprised to see the artist had created another sculpture I know. 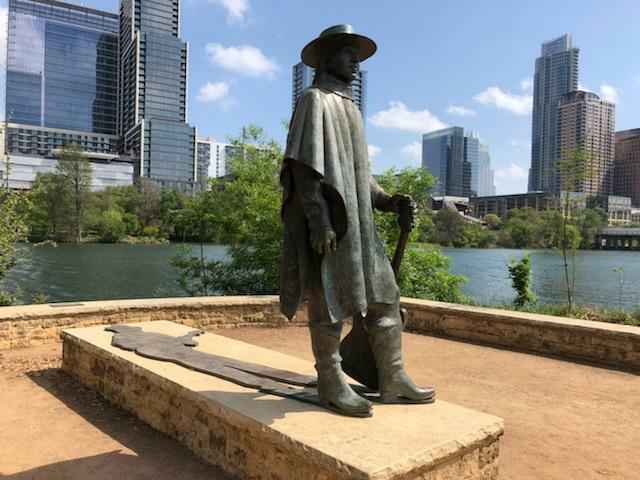 Helmick is also responsible for the Stevie Ray Vaughan Memorial on Town Lake in Austin, TX. I’ve visited that staute before. The muscian wears a poncho and a big hat with a brim running all the way around it. Austin folklore has it that as a tribute to Vaughan, fans leave joints on the brim of his hat. I suppose it works as a sort of “take a joint, leave a joint” gift economy, because I was told to always reach up and search for a joint. I suppose if there’s one up there, the finder smokes it in Vaughan’s name. When I visited the statue, I reached up, but didn’t find any treats on the hat. I took the photos of Drawing Room in this post. 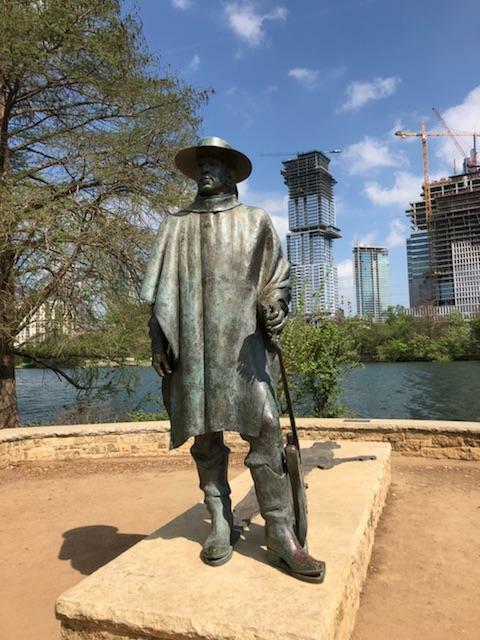 My friend Lou took the photos of the Stevie Ray Vaughan Memorial. Thank you, Lou! When my dad died, my sibling insisted I travel to Mississippi for his memorial service. I was house sitting in Tracy, California when he passed on Monday afternoon. My dad’s wife scheduled the memorial service for the upcoming Friday evening. By Tuesday I’d bought a $600 round-trip airline ticket. By Thursday morning, I was flying out of Oakland, on my way down South. My sibling and my sibling’s partner met me at the airport in New Orleans. They rented a car, and the partner drove us through the darkness surrounding Interstate 10, all the way to Ocean Springs. The three of us visited awkwardly with my father’s wife (who was holding up exceptionally well), then headed to Bay St. Louis where we would spend the night. We stayed at the home of my sibling’s partner’s aunt and uncle. The aunt and uncle were out of town, but they graciously offered us the use of their empty home. It was dark when we pulled into the driveway, but my sibling managed to find the hidden spare key. It wasn’t long before we were passed out in the spare bedrooms, exhausted and probably still shocked at the unexpected death of the patriarch. My sibling and the partner and their son had visited my dad and his wife the previous summer. During the visit, my dad and his wife had taken them to see several “Katrina Trees.” The “Katrina Trees” were trees that had been killed by Hurrican Katrina in 2005 and later carved into large-scale sculptures. My sibling wanted me to see at least one of these trees that meant so much to my dad and his wife. The trees were victims of the saltwater storm surge of Hurricane Katrina. There was no plaque with the tree, no explanation or artist information. 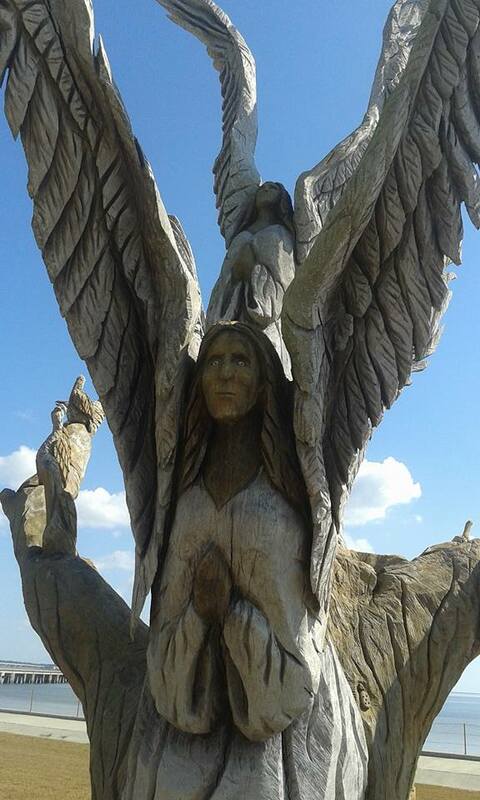 I did some internet research and determined this tree was carved by chainsaw artist Dayle Lewis of Indiana. 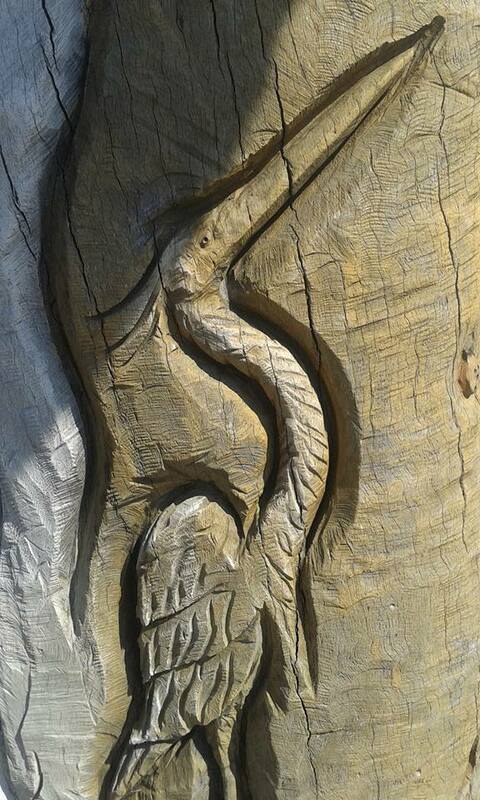 My conclusion was confirmed by “Lewis 2012” carved into the bottom of the sculpture, just under the heron. 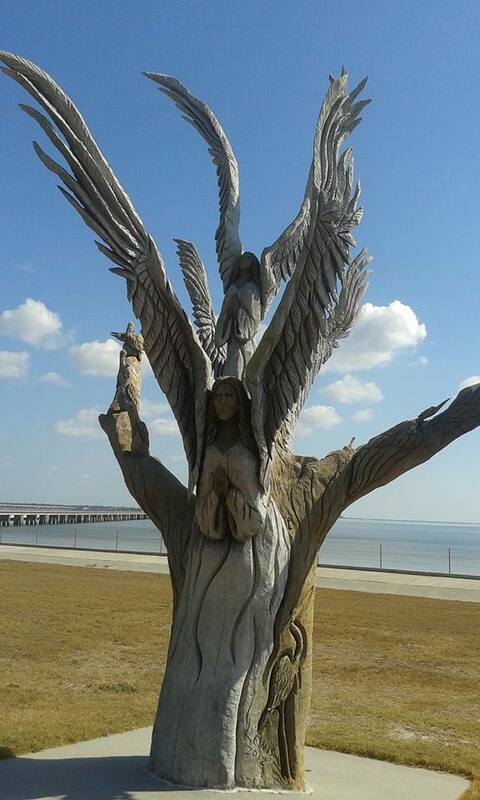 Lewis has carved angel sculptures out of six live oaks killed by Hurricane Katrina’s 40-foot saltwater surge. The trees can be found throughout Bay St. Louis. The most elaborate of the four angel trees looks out to sea, just like the original one — it has several angels carved into it, along with some herons, ladybugs, turtles and pelicans. One of the angels has white eyes — of all the angels that adorn the four angel trees, it’s the only one with white eyes. The tree I visited is clearly elaborate, faces the sea, features turtles, herons, and pelicans (sorry, but I don’t remember any ladybugs), and includes an angel with white eyes. We didn’t stay at the tree very long. I took photos, and my sibling hugged it, then we headed back to my dad’s house to prepare for his memorial service. We didn’t stay long, but it did me good to see the tree. It did me good to see such a wonderful part of the life of my father, a life that I missed for so many years. Since I wrote about a horse yesterday, I thought I’d stick with the theme and write about a horse of a totally different kind I saw in Truth or Consequences, NM. I was house and dog sitting in a neighborhood near the hospital. One morning while walking the dog, I went down a street I hadn’t explored before. I looked over and saw a horse…a metal horse. The sculpture was located in a fenced area between two houses. The fenced area was more of an empty lot than a yard. The fence was of the hurrican variety, so the horse was entirely visible. While the gate was open, I didn’t go into the enclosed area. I thought that might be a little too much like trespassing. Thankfully, I was able to aim my camera up and over the fence so I could get an unobstructed view. There was no plaque to go with the sculpture, nothing about the artist or the medium or the technique used to create this creature. Maybe it’s a piece of yard art like I sometimes see being sold in tourist towns. Even if it is “just” yard art, I still like it. I like the horse sculpture in general, but especially the mane and tail. I like the jauntily raised hoof and the three-dimensionality of the piece. This is not some flat cutout! This horse has heft. One of my favorite parts of house and dog sitting is exploring new neighborhoods and discovering their character. 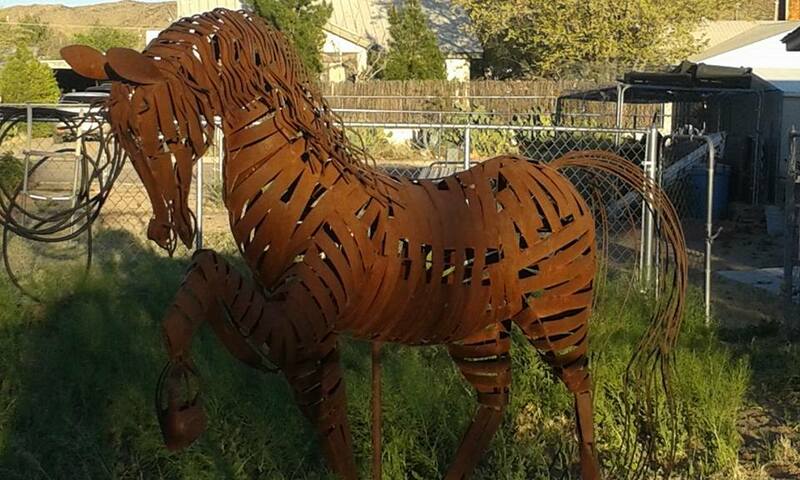 I like the spirit this metal horse adds to its block. 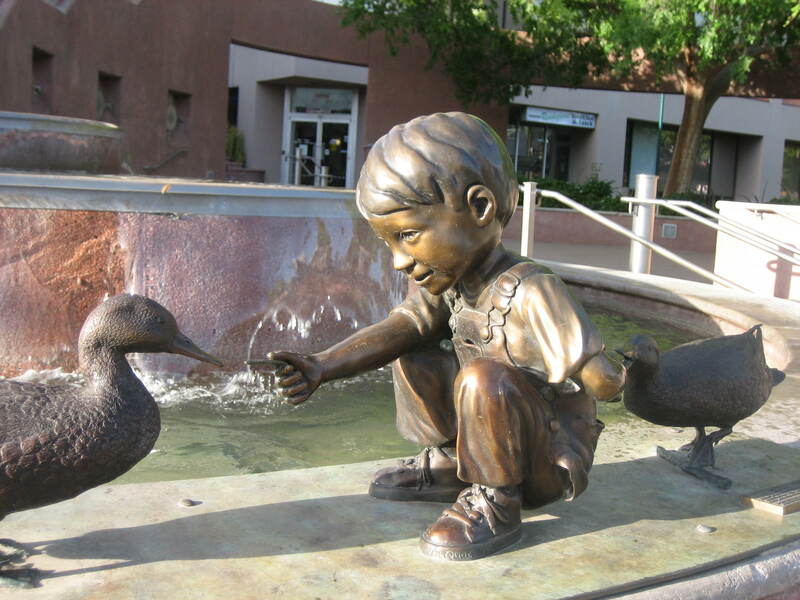 Quackers is yet another sculpture in the permanent collection in downtown Mesa, AZ. It is located next to a large fountain near the northwest corner of Main and Center streets. 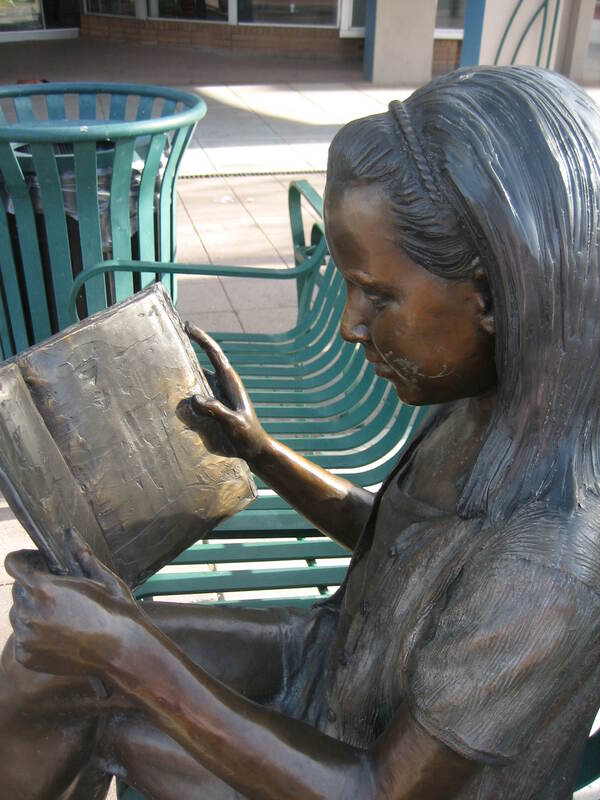 (You can learn more about all of the sculptures in Downtown Mesa’s Permanent Sculpture Collection by looking at the brochure for the self-guided tour. 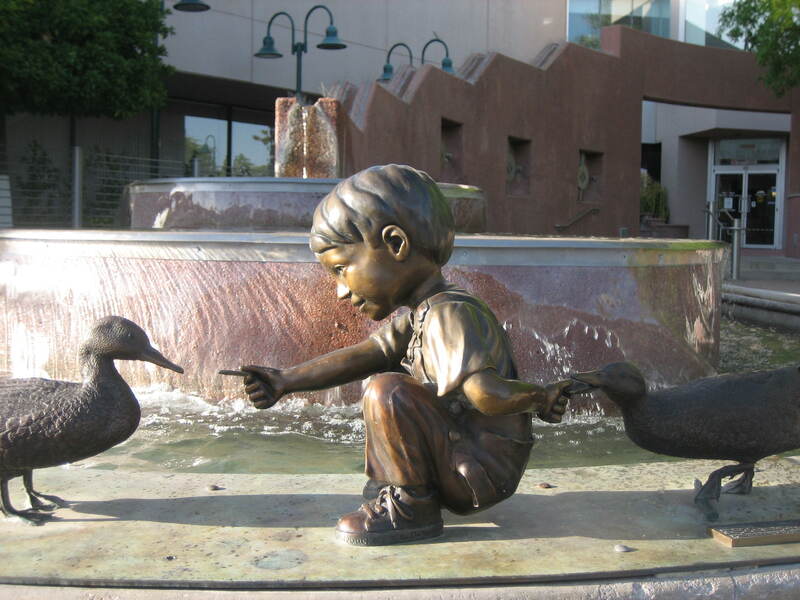 Mike was inspired to sculpt “Quackers” around his two year old son Nathan and his love of feeding the ducks at the local park. Nathan would hold on to crackers or bread and try to get the ducks to come in as close as possible. This was Mike’s first sculpture of a child. He used real measurements from Nathan, even going in with his calipers and measuring ears nose and extremities while Nathan was napping. He also took many pictures of the active, small boy in many different poses. 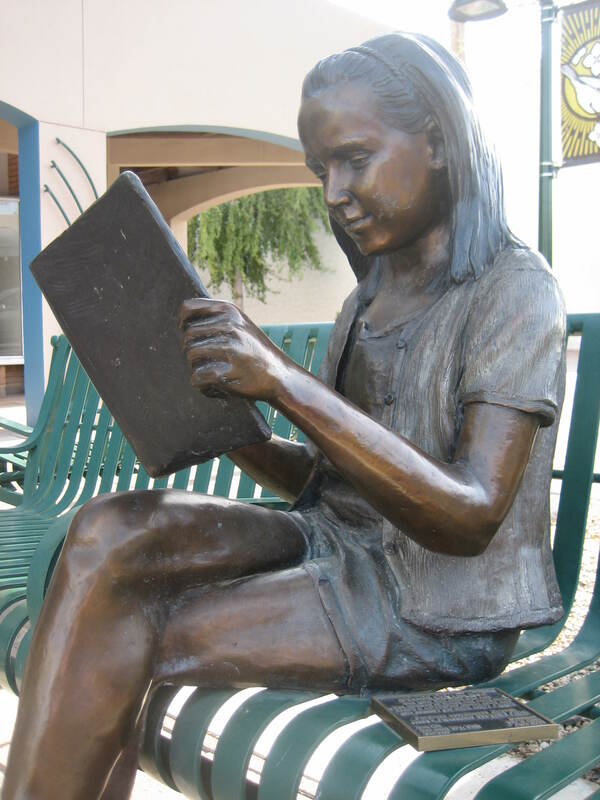 The sculpture was purchased through the City of Mesa’s Permanent Sculpture Panel and was dedicated in April 2004. I think this is a really cute piece of art. How can Mesa go wrong with a little kid feeding ducks? What I really want to know is how the city keeps people out of that fountain in the summer. 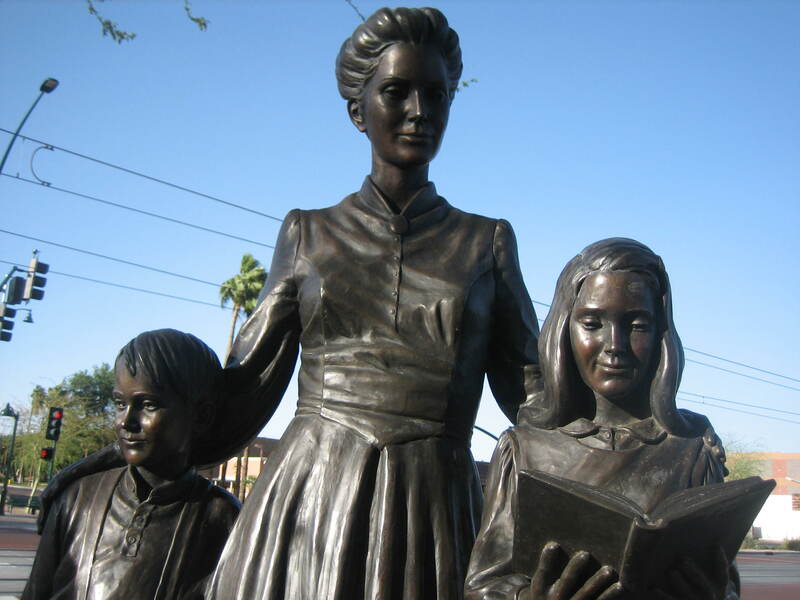 I’ve written before about the sculptures on Main Street in Mesa, Arizona. (You can read past posts about The Big Pink Chair and Booked for the Day.) 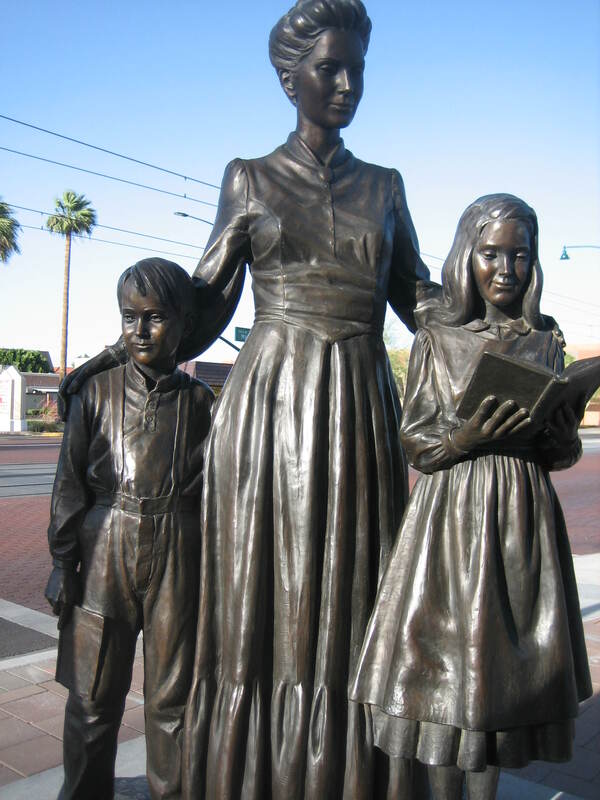 Today’s featured sculpture is called Teaching Children Since 1878. 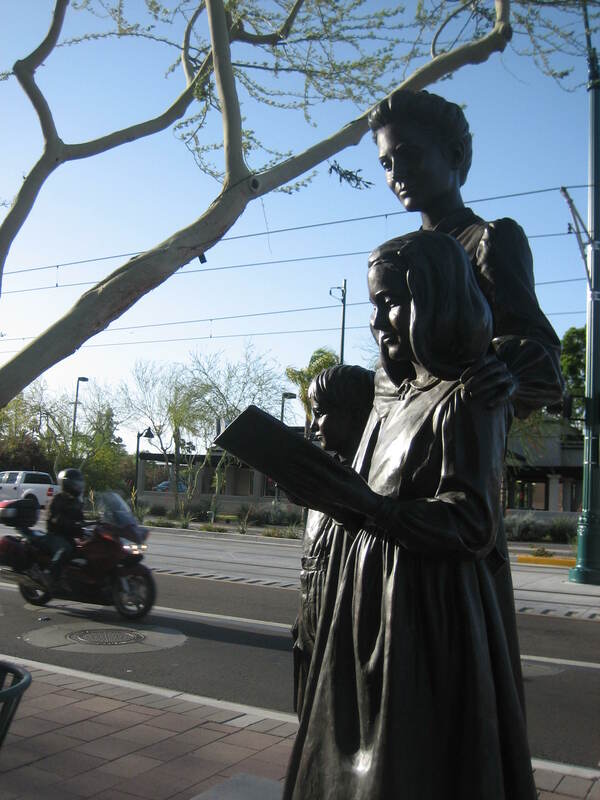 The sculpture is the central piece of a larger plaza setting, which includes 16 bronze or brass relief plaques on surrounding stucco wall with inscriptions on the history of education in Mesa and 4 columns from the original Mesa High School (formerly known as the second Abraham Lincoln School). The brochure with information about the self-guided tour of the Mesa’s sculpture collection lists the sculptor as James Avati, but the aforementioned Smithsonian Institution website lists three people as sculptors of this piece: James R. Avati, C. L. Harding, and Dennis Tidwell. James R. Avati of Redbank, New Jersey, and Salt Lake City, is an excellent and sensitive sculptor who studied at the Newark School of Fine and Industrial Arts, at the Arts Students League in New York City, at Ricks College in Idaho, and at Brigham Young University. He was also a graduate student in the Department of Art at the University of Utah where he earned his M.F.A. in 1988. While there he worked with Angelo Caravaglia in the development of his frequently powerful art. 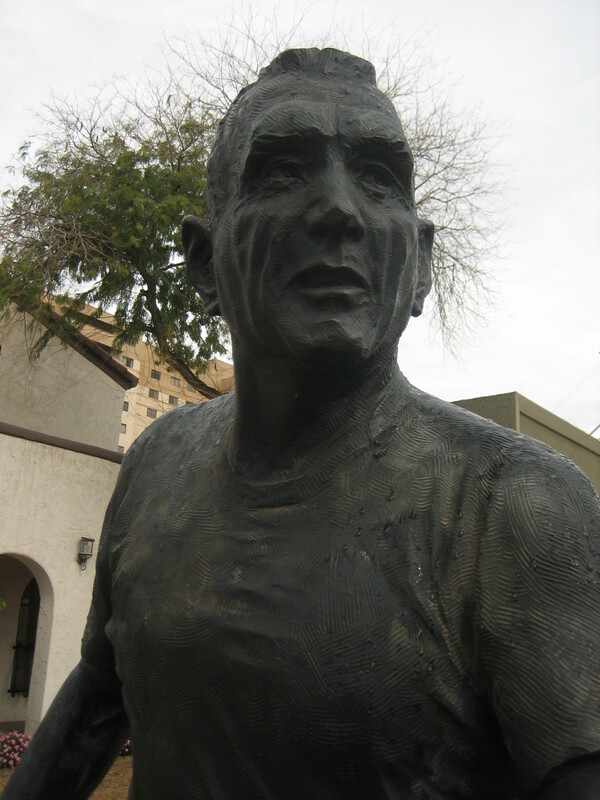 This life-size bronze sculpture is located on the south side of Mesa’s Main Street, on the corner of Sirrine Street. I enjoy the juxtaposition of the fashions worn by the teacher and her students against the backdrop of modern buildings and cars, motorcycles and traffic lights. The teacher reminds me of a statue of a pioneer woman in Austin, TX a friend and I once used as the star of a short film. Next time you’re strolling in downtown Mesa, be sure to checkout these scholars. 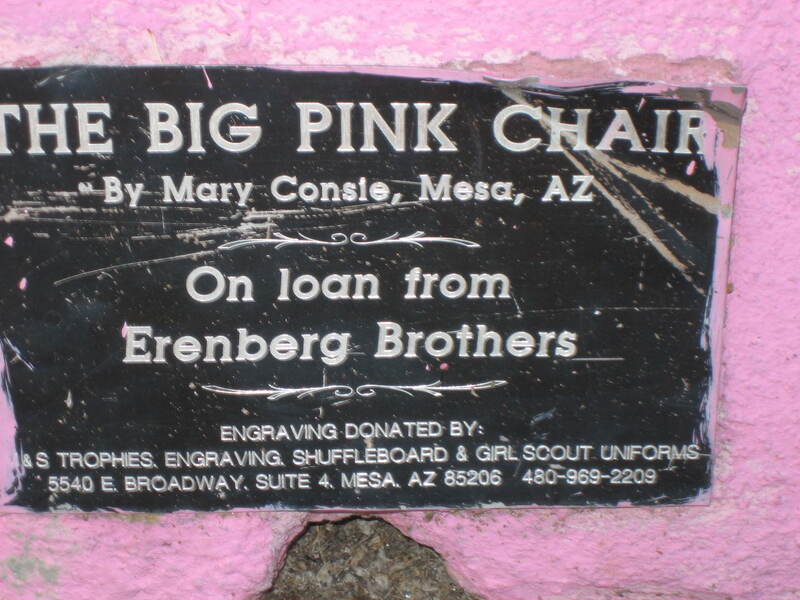 I recently wrote about the public art on Main Street in Mesa, AZ and mentioned my favorite sculpture there, The Big Pink Chair. 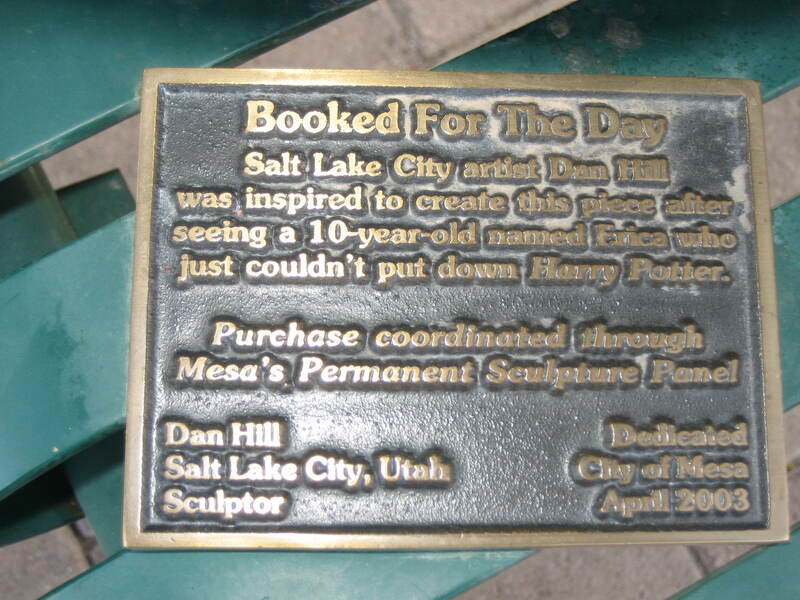 Another piece in Mesa’s outdoor art collection that I like a lot is Booked for the Day by Dan Hill. 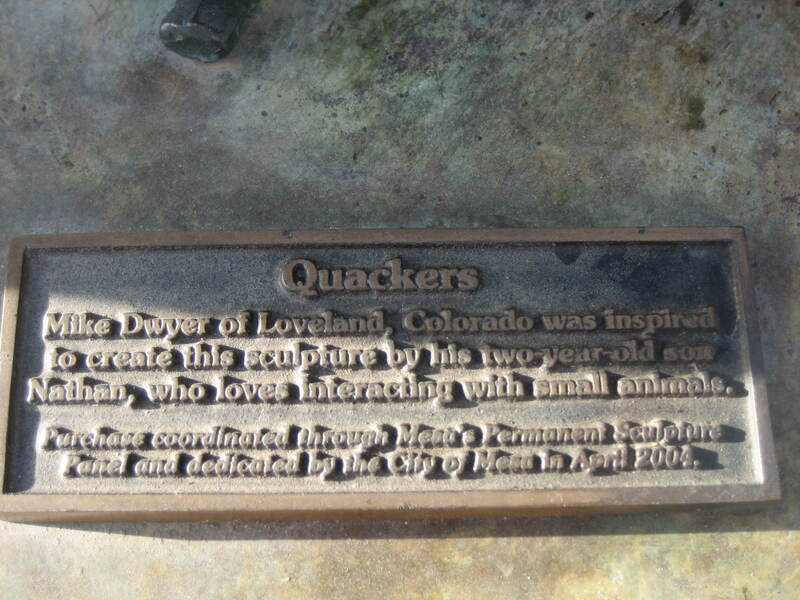 The statue is made from bronze, and is 42″h x 16″w x 30″d. It has a copyright of 2000. Of course, I like the fact that the girl is reading. I love reading and books, so I was tickled to see two of my passions depicted in art. I also like the fact that the sculpture is sitting on a bench, out in public, just like a real person. 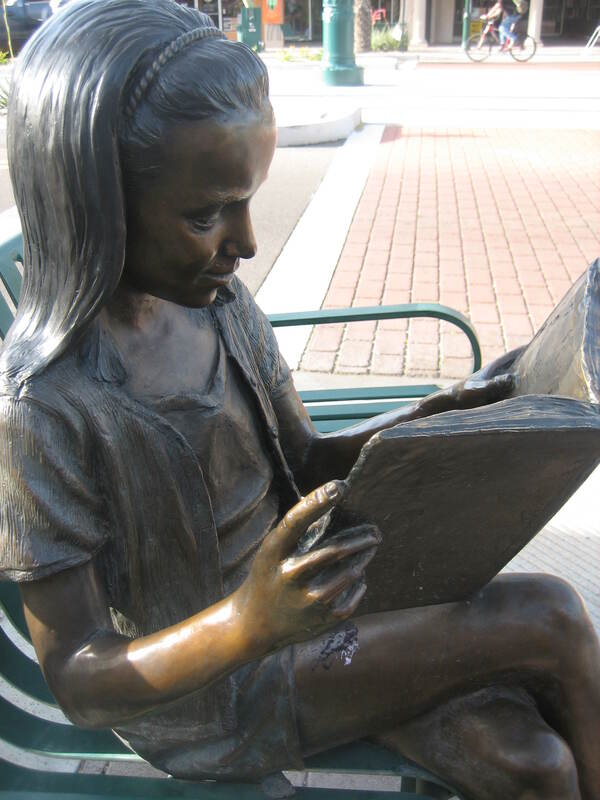 It’s fun to sit next to this depiction of a young reader or stand behind her and look at the pages of the book over her shoulder. Oh, the possibilities for photo opportunities for anyone visiting Mesa’s Main Street with friends! A good book is hard to put down and this girl won’t be putting her book down anytime soon. Ten-year old Erica, engrossed in Harry Potter, was the inspiration for this interactive sculpture. This sculpture is in the permanent public collections of the City of Mesa, Arizona; the Carnegie-Evans Public Library, Albia, Iowa; the Palos Heights Public Library, Palos Heights, Illinois; the Eccles Community Art Center, Ogden, Utah; City of Ankeny, Iowa; Cleary University, Ann Arbor, Michigan; Main Street Garden, Twin Falls, Idaho; the Prescott Public Library, Prescott, Arizona; and the Ligonier Public Library, Ligonier, Indiana. [Dan Hill’s] talent for s[c]ulpting emerged accidentally in 1974 when he was lounging around at home recuperating from a work related foot injury. While watching an old western on television, he began messing around with a toothpick and some playdough [sic]…By the time the movie had ended [Hill] had sculpted a small bust, capturing a remarkable likeness of actor Lee Marvin. These humble beginnings as a sculptor were followed by the early success of two sports action sculpture commissions and a first place ribbon in the Professional Sculpture Division at the Utah State Fair. Booked for the Day is located on the south side of Main Street, between Robson Street and MacDonald Street. 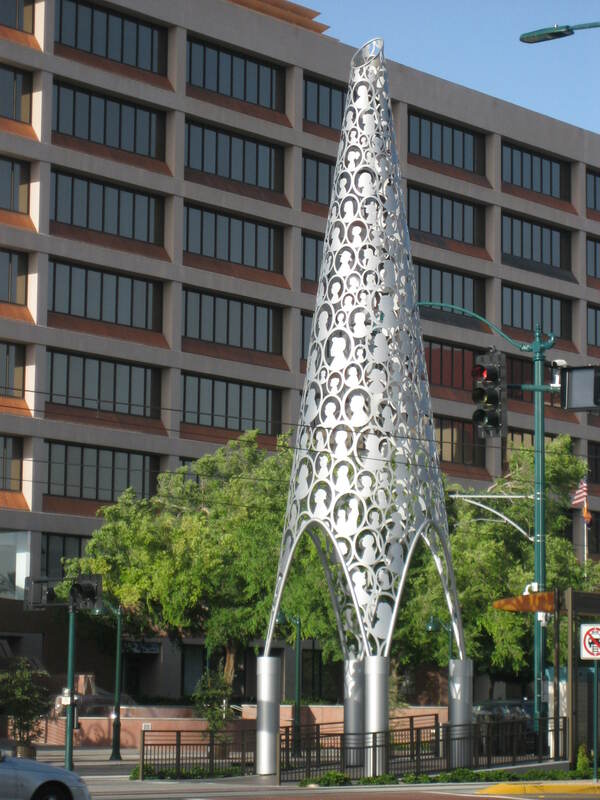 To learn more about public art in Mesa, view the brochure that goes along with the self-guided tour of the city’s sculpture collection. SAD UPDATE: I was in Mesa in mid March, 2018, and the Big Pink Chair was GONE. My friend and I walked up and down Main Street in the whole area where the permanent art pieces are and we found no Big Pink Chair. I was so sad. I was going to get my friend to take a photo of me sitting in it. I can only assume the folks who were loaning it decided to take it back. Mesa, Arizona is a very strange town in the greater Phoenix metro area. 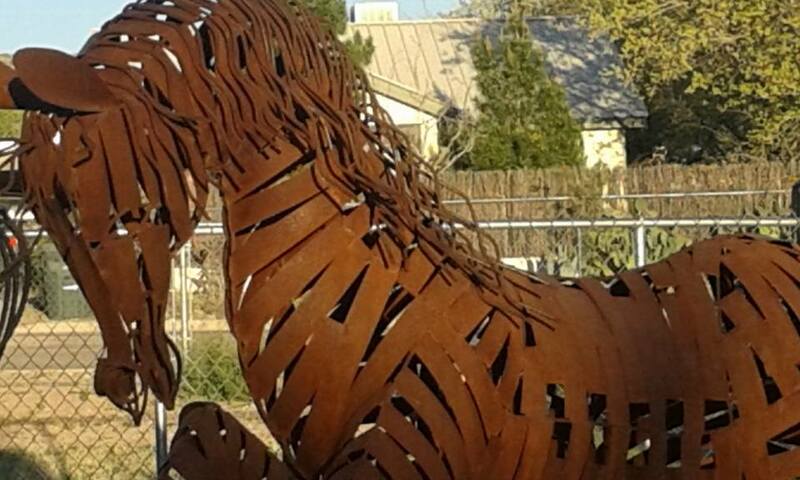 Mesa is full of Mormons and meth and…art. Well, at least downtown Mesa is full of art. 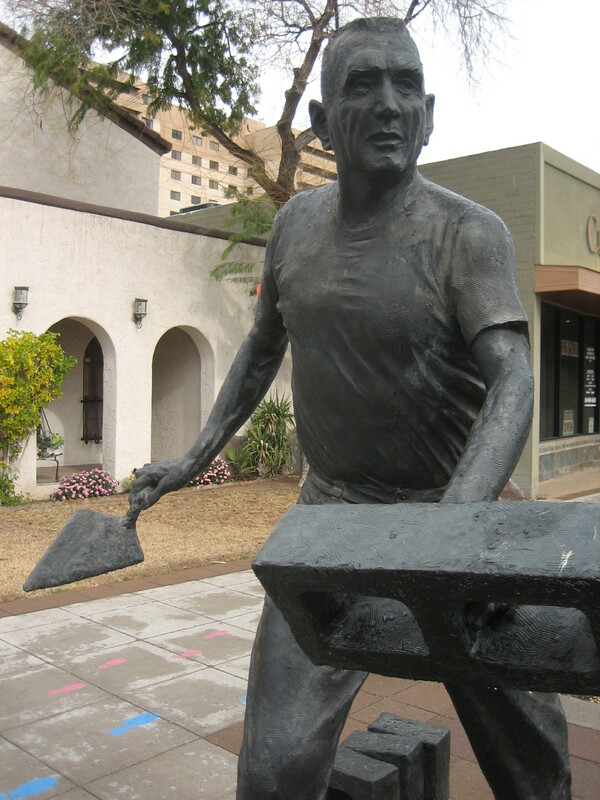 Mesa’s Growing Permanent Sculpture Collection features 39 fine pieces, most of which are displayed downtown (four privately owned sculptures are also on loan). Enjoy a FREE self-guided outdoor walking tour of the sculptures any time of day or night, any day of the week. 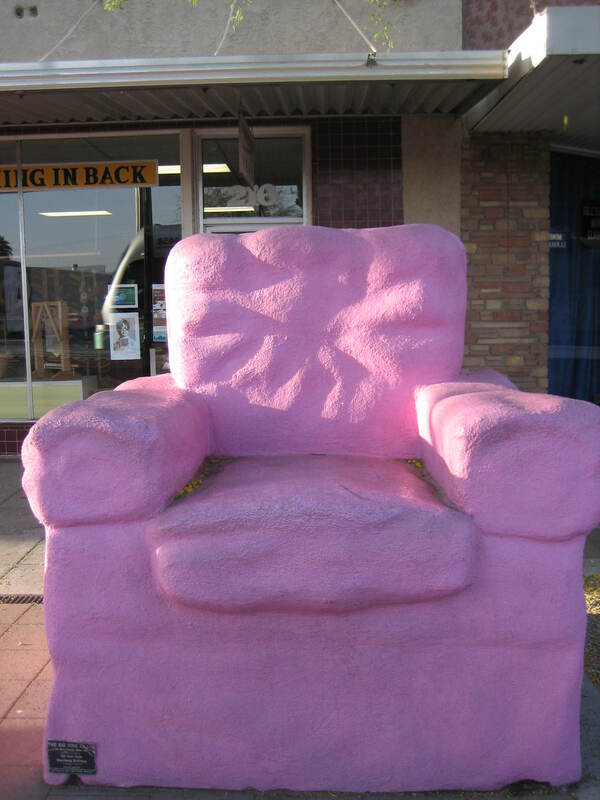 My favorite piece in Mesa’s sculpture collection is The Big Pink Chair. The above photo does not do it justice. It’s not just a big pink chair. It’s a BIG pink chair. An adult sitting in it looks like a little child. When I sit in it, my legs don’t hang down. When I sit in it, my feet stick straight out. And yes, folks can climb up and sit in the chair. It makes for a great photo op, so visit it with a group of friends (especially if you time your visit for 3am). The Big Pink Chair is a work by Mary Consie. It’s located on the north side of Main Street, between Morris Street and Robson Street. 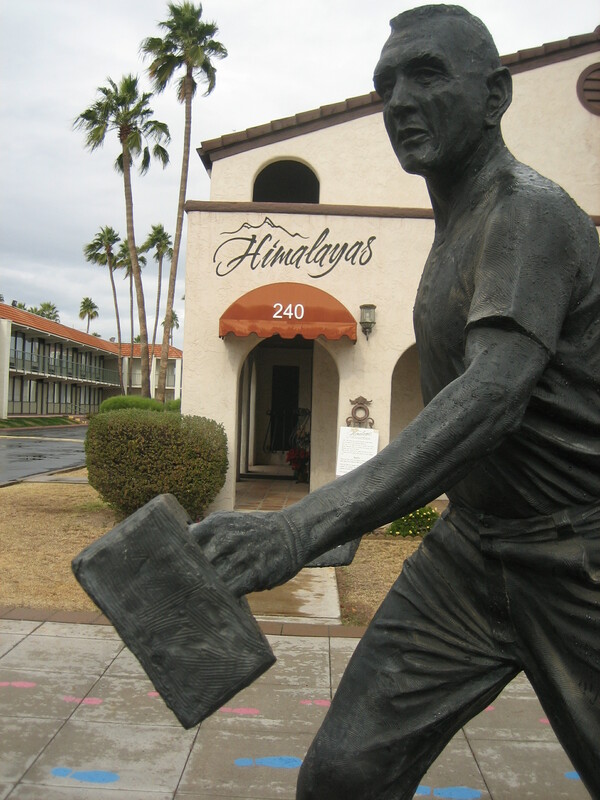 When I passed through Mesa, Arizona, I saw a statue that is obviously the fellow worker of the Toilet Paper Hero of Hoover Dam. According to the Waymarking website, this man is John W. “Pete” Peters. The statue was sculpted by Russell W. Bowers and stands on Main Street, near Morris Street. 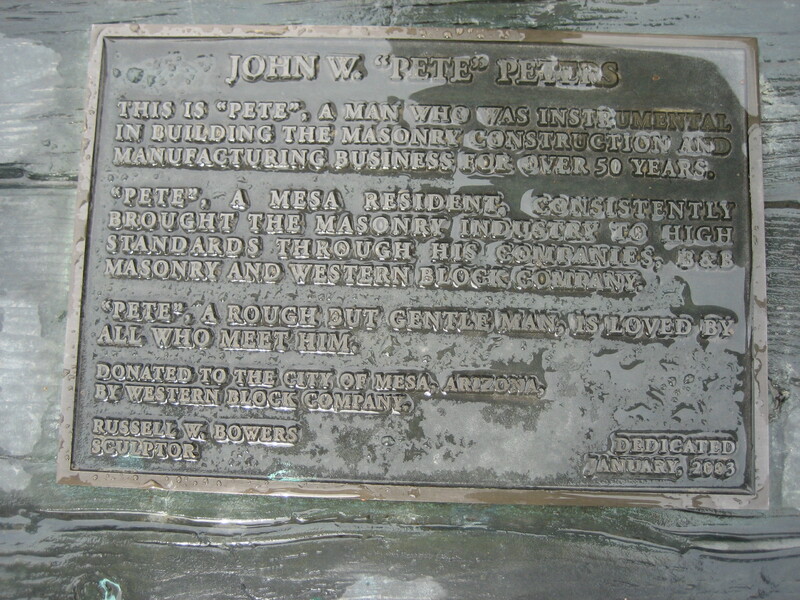 The statue was donated to Mesa’s permanent sculpture collection by Western Block Company, a company Pete owned. It was dedicated in January 2003. I like the way this statue seems dynamic, as if Pete is about to actually lay down that cinder block and spread mortar on it. Most statues seem static, so this one really stood out for me. 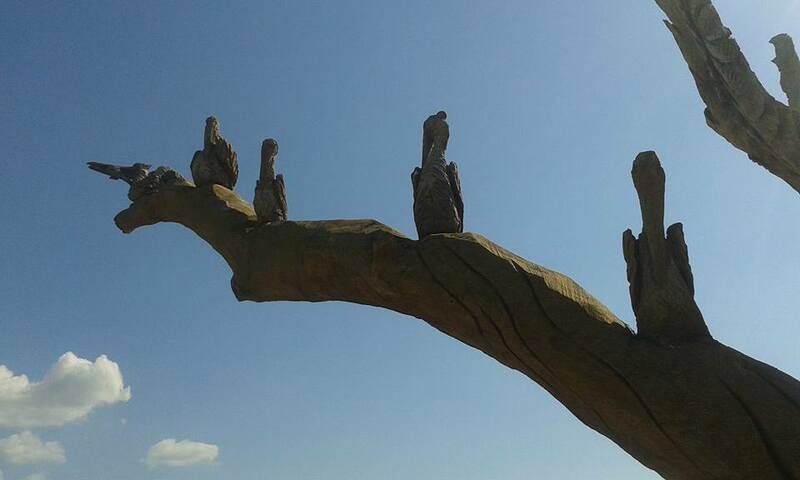 Mesa, Arizona has an outdoor permanent sculpture collection. Humpty Dumpty is one of my favorite pieces in that collection, and I took this photo of him in March 2015. I love his yellow bowtie that matches his socks! I love his metalic shirt and the color scheme of his striped bodysuit. Most of all, I like the big, big smile on his big, big face! 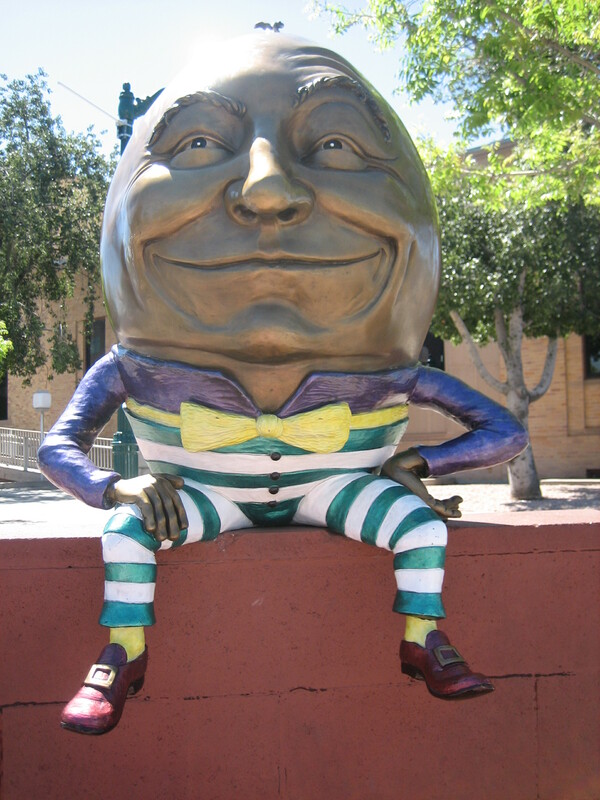 Kimber Fiebiger has crated a LOT of sculptures of Humpty Dumpty. See more here: http://artbykimber.com/humpty-dumpties/jumbo/, here: http://artbykimber.com/humpty-dumpties/small/, and here: http://artbykimber.com/humpty-dumpties/large/.